1. Disconnect. Power down your computer–or if you absolutely need the thing for some reason related to your practice and studies, sever it from the internet by disabling wireless. 2. Banish Television. According to Nielsen, the average American watches thirty-four hours of television per week (figures in your country are likely similar). Thirty-four hours of television! You know how much time top-shelf violinists spend practicing each week? About twenty-seven hours. Here’s a short clip from the Acoustic finger-picking Seminar with Gretsch Guitar’s Paul Pigat. 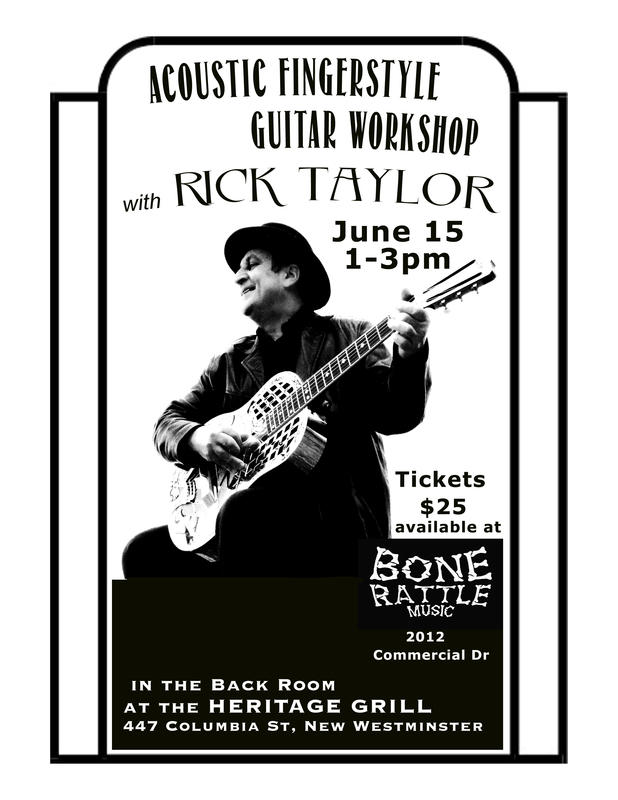 Saturday April 20th 1-3pm, Bonerattle Music and Uke Joint are presenting an acoustic Finger-style Guitar Workshop with one of Canada’s finest Guitarists, Paul Pigat. Where: the Heritage Grill, 447 Columbia St, New Westminster, Canada. Tickets are available from Bonerattle Music, (East Vancouver’s coolest little music store), 2012 Commercial Dr, Vancouver, Cost is $20. Here’s a great article by Chad Mundt. Some of these tips apply more to Bassists but most apply universally to any instrument. 1) In order to master an musical concept, you must understand not only what it sounds like, but what it looks like and what it feels like. 2) If your fellow musicians can’t describe in a concrete way what you just played, then your idea either killed or flopped. Which of the two will be obvious. 3) Learning music from a book is okay, learning music from a recording is good, and learning music from a video is great, and learning music from the artist himself is optimal! 4) Harmony can be understood in two distinct ways, as color ie. hearing harmony as a thing in and of itself, or as multiple melodic lines ie. hearing each individual voice as distinct melodies. Each method has it’s own strengths, but the latter choice is more difficult to achieve and is ultimate the more powerful. 5) The piano is the single best instrument for the comprehension of music: It covers an enormous range, it is polyphonic, and has become the instrument of choice for the computer age in the form of MIDI. 6) One of the most under-practice skills in music is coordination. Coordination is musical multi-tasking; it is your ability to hear multiple freely-moving ideas all at once. Bach could improvise six-voice fugues with complex musical phrases interloping in perfect counterpoint. You should start with two simple ideas: a bassline and a melody. 7) It is better to be told to turn up than to be told to turn down. 8) Drum Machines are your friend. They don’t complain, they don’t get tired, they work for a one-time fee, and they sure beat the heck out of a metronome. 10) Practice habits should be just that: habits. Reinforce them with other healthy habits. Try writing out your practice plans beforehand, giving yourself a treat before or after practicing, and/or practicing at the same time everyday. 11) Make sure that you don’t practice with your sound source parallel to the walls. I very nearly quit music forever before I realized that the weird, out-of-tune noise sound that I was hearing from my trumpet bell was a strange harmonic ringing in my bedroom! 12) Most guitar and bass amplifiers have very low quality speakers factory installed. Hook your iPod to the input of your amp and sample just how poor it sounds. Some recent high-end amplifiers such as the Markbass CMD 103H Bass Combo Amps and theWarwick Hellborg Amps have good quality speakers, but they are in the minority. 13) Knowing how to get your bass to sound like a p-bass is just as important to you as learning how to sing in a falsetto is to a professional singer. 14) Whether you like it or not, playing the upright will make you a better electric bass player. 15) If you want to sound like Marcus Miller, study Louis Johnson and Larry Graham. 16) If you want to sound like Christian McBribe, study Ron Carter and Ray Brown. 17) If you want to sound like John Patitucci, listen to Anthony Jackson, Michael Brecker, and Brazilian rhythms. 18) If you are going to college for music, make sure to take advantage of other opportunities there, even if they lie outside your major. I guarantee you’ll use the information you learned in those Accounting, Marketing, and Web Development classes way more than the information you got in Atonal Harmony. 17) You should have both a mirror and a portable recorder in your practice area. 18) When practice difficult time signatures, try to feel a 2-count as short and a 3-count as long. For example, Dave Brubeck’s Take Five should be felt as long, long, short, short. 19) Putting a little compression (not too much) on your bass can do wonders for your tone. Exceptions include many single coil pickups, as the hum will be compressed along with your tone, amplifying it. But, then again, this hasn’t stopped me from pushing a Danelectro bass with single-coil Lipstick pickups pushed through my Boss CS-3. 20) You may hear of people boiling their strings to make them last longer, but don’t expect a miracle. This only works on flatwounds and it only works for maybe one show’s worth of playing before your strings are deader than ever. 21) Learn to sing harmony. Your value as a bass player has just tripled. 25) Tapping licks are cool, but unless you’re playing Thunderstruck in a unison line with the guitar play in front of a frat house, you’ll probably never get to use those licks on stage. I personally recommend getting that alternating plucking technique and western harmony up to 1940 mastered before you even attempt to tap.